In this trail, we continue on through the beautiful countryside of Suffolk, heading in a southwesterly direction, we go through ‘chocolate box’ villages, and low, rolling hills. After leaving Eye (see Trail 14), we arrive at a small industrial site and a former USAAF/RAF base, RAF Mendlesham. Difficult at first to see, Mendlesham is adjacent to the main A140 a few miles south of Eye. However, a huge radio/TV mast marks the site, and this mast is visible from miles around. 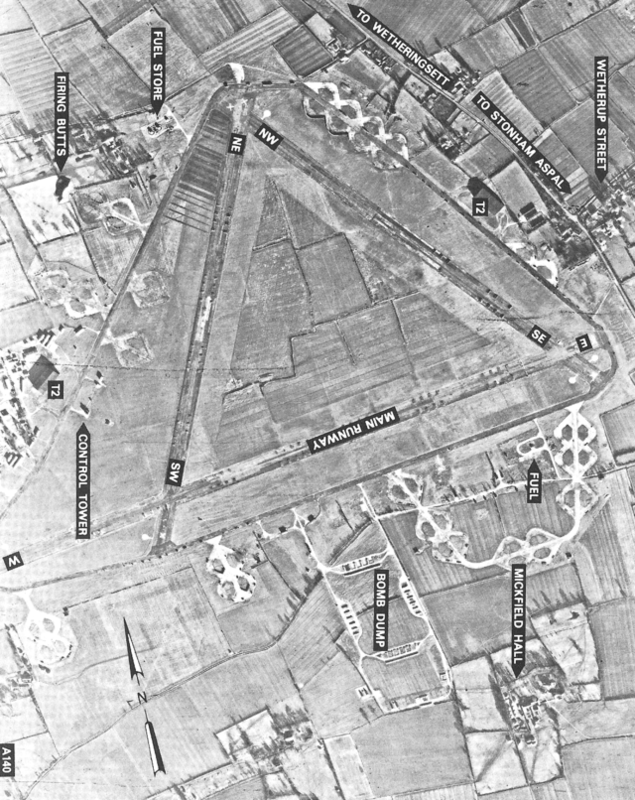 Mendlesham was designed in a triangular shape (rather than the more traditional ‘A’ shape), encircled by one continuous perimeter track. It had three runways: the main runway of 2,000 yards running east – west, a second of 1,400 yards running north-west to south-east and a third of similar size running north-east to south-west. An extensive site, it housed two T2 Hangars, numerous hard standings, a hospital unit, fuel depot, bomb store and all the usual administration blocks scattered away from the main area. These definitive ‘Masters of the Skies’ boasted an excellent record being part of Bader’s ‘Big Wing’ in the defence of Britain during the autumn of 1940 when they flew Hurricanes. Now, armed with the more effective Spitfire Mk IX, they were given the task of carrying out “Ramrod” missions, a USAAF term for protecting bombers on daylight raids over occupied Europe. The tail code for these aircraft was the “Square S”, and the group was formed using the 4th (Q6), the 7th (R2), the 18th (81) and the 391st (3L). Bombardment Squadrons. Formed on 20th November 1940 and activated on 15th January the following year, they initially flew patrol missions along the United States’ East Coast looking for Japanese submarines following the attack on Pearl Harbor. 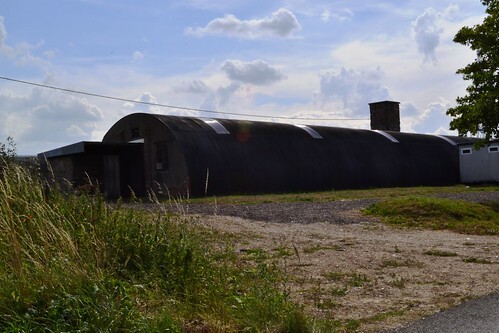 Once at Mendlesham, the 34th BG helped prepare for the invasion of Normandy by bombing strategic airfields in France and Germany, along with coastal batteries and communications links on D-day itself. This strategic bombing campaign continued, adding attacks on St Lo on the 24th / 25th July and ‘V’ weapon sites throughout the summer months. The 34th carried out some 62 missions with these B24s before switching back to their orignal B-17s in September that year. 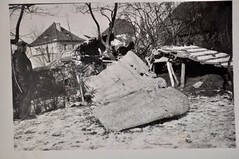 Attacks continued throughout 1944 and into 1945, including marshalling yards such as: Ludwigshaven, Hamm (where returning bombers were followed and attacked by German night fighters), Osnabruck and Darmstadt; Oil centres at Bielefeld, Merseburg, Hamburg, and Misburg. They also targeted industrial areas in Berlin and Hannover, along with numerous airfields in the German heartland. The 34th also supported troops in the ‘Battle of the Bulge’ and then further attacked communication lines until the cessation of conflict in 1945. Immediately after the war, the 34th flew humanitarian operations supplying food to the Dutch and bringing home POWs from German prison camps. 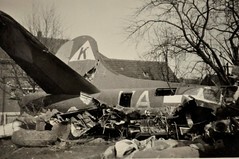 Throughout the war, the 34th maintained an impeccable record losing more aircraft to accidents than enemy activity. During their 170 missions they lost 34 in combat and 39 to ‘other causes’. Even for this record, the 34th never received any awards or decorations. Threshold of the NE/SW NW/SE runways. The 34th eventually departed Mendlesham in July 1945 and the site became a store for surplus ammunition until it too closed in 1954. It was then returned to agriculture having the majority of its concrete and buildings removed. 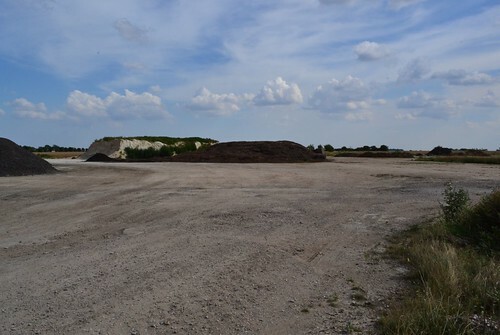 Today the site has been taken over by small industrial complexes some of which have utilised the concrete laid down in Mendlesham’s conception. Access is through a manned security gate, but little is to be gained from here. Best views of the remnants are from the road prior to this entrance; ‘Town Lane’ a small country road that leads to the nearby Hamlet. Along here is a small complex where a number of minor building can be seen including a Nissan hut and hospital with ablutions block. Continue further along this road and you pass what would have been the fuel store and eventually you come to the threshold of the two runways and perimeter track. A large area this is where the two smaller runaways the north-west to south-east and north-east to south-west joined and is now used for storage by the local farmer. Hangar now used for Paragliding. Continuing along this road and then turn right, you will see a Blister hangar now used by paragliders along the remnants of the east – west runway which is now covered by grass. This hangar sits at what would have been the threshold of the east – west and north-east to south-west runway. It is believed there is a T2 hangar within the industrial complex viewable on Google Earth, but its existence cannot yet be verified. Other minor brick structures can be found amongst trees and hedges with care and a good deal of persistent investigation. Just off the main A140 is a memorial which housed a rather large and stunning bronze carving of a bomber pilot. In 2010 however, this was stolen and the site has become increasingly vandalised. The local church warden at Mendlesham informed me that they are currently raising money for a new site by the church which can be better protected and give greater recognition for the service of those who were stationed here during that time. 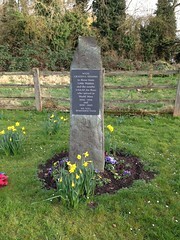 The now dilapidated memorial beside the A140. The carving covered the area above the wreath. ‘Thank you for your sacrifice. You helped destroy the evil axis regimes of hate. Without your bravery and many men like you, Germany would have taken all Europe including us. We owe you a great debt. It is with our eternal gratitude and respect we thank you. 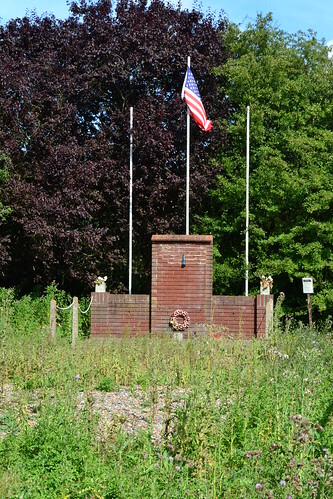 Unlike many other bases around Suffolk and Norfolk, Mendlesham’s history was relatively quiet, it does however, remain as a monument to Britain’s heritage and to the USAAF efforts in bringing the Second World War to a close. For Mendlesham memories, stories and information click here. A site dedicated to the 34th can be found here. 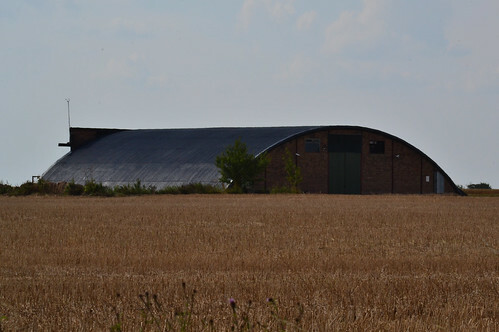 From the main A140, continue SW to another USAAF base and one with a rather interesting history – Rattlesden. Another one of those airfields where nature and agriculture have both reclaimed a large part of it, but Rattlesden Clings on desperately to life allowing a small part of the former runway to be used for gliding activities. Built and opened in 1942, Rattlesden had three intersecting concrete runways, hardstandings for up to fifty-seven aircraft, and two T-2 hangars. 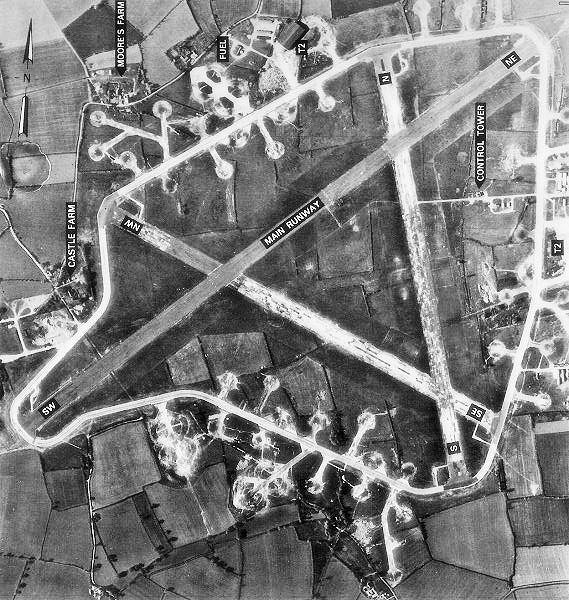 The main technical site was built to the east of the site, whilst the 2nd site to the north and the bomb site to the west, just off the main runway. It would cater for 2,894 staff. 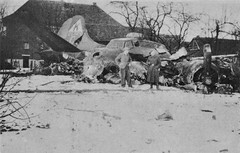 The first residents of Rattlesden were the B-26 Martin Marauders of the 322nd BG who remained until the following April. 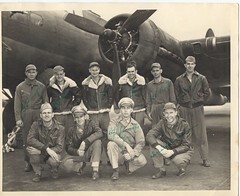 After their departure, the airfield remained quiet until the arrival of the Heavy Bomb group of the 447th. consisting of four squadrons, the 708th, 709th, 710th and 711th Bomb Squadrons, they could be recognised by their white Square ‘K’ on a black square. Many enthusiasts and model makers would recognise the 447th B-17 as the Airfix model in particular ‘A bit o’ Lace‘ #42-97976 of the 709thBS, first made in 1962. Originally designated ‘Louie the Creep’, B-17 #42-97976 was repaired and modified around November 1944 and returned to Rattlesden as ‘Bit o’ Lace‘. She went on to complete 82 missions in total before being returned via Bradley Field, Boston, to Kingman AAB for storage. Later she met an ungainly ending being stripped and scrapped on 9th November 1945. ‘Bit o’ Lace‘ earned notoriety under the charge of Lt. Thomas M. Mustaleski, on 4th April 1945 while on a mission to Kiel the left horizontal stabiliser was blown completely off and the fin shredded. This made not only flying, but flying in formation and bombing very difficult. For his efforts, Mustaleski won himself the DFC. 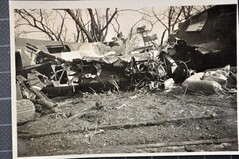 Other heroic tales came out of Rattlesden, Robert Femoyer posthumously earned the Medal of Honour for his “conspicuous gallantry and intrepidity at the risk of his life above and beyond the call of duty” when a B-17 he was in was severely damaged. Femoyer repeatedly refused medical aid until the group was clear of enemy flak and further danger. He eventually succumbed but died from his wounds after landing back at Rattlesden. The Control Tower now a club house. The 447th took part in many battles over occupied Europe, including: the Battle of the Bulge, supporting the Normandy invasion, attacking submarine pens, ports and missile sites, marshalling yards and curtailing aircraft production during the ‘Big Week’ raids. Prestige targets such as: Goth, Kiel, Ludwigshafen, Cologne Politz and Fallersleben all came under the 447th spotlight. 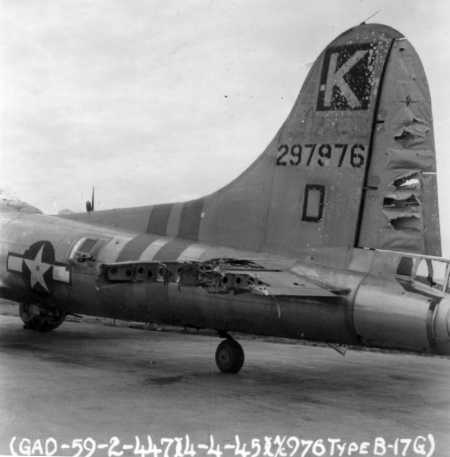 Throughout the war, the 447th flew some 257 missions losing 97 aircraft in the process. The 447th finally returned to the United States in August 1945 and were inactivated on November 7th that same year. Rattlesden itself, was transferred to RAF ownership on 10th October 1945. It was used by the RAF for basic training and then by the Ministry of Food for storage. It was finally deactivated on 15th August 1946. A short revitalisation in the 1950’s and 60’s saw Rattlesden as an emergency landing ground for the Wattisham Hunters and Lightnings, but it was fortunately never needed. The 1960s saw part of the site used for RAF Bristol Bloodhound surface to air missiles in defence of the UK during the Cold War, but these were later withdrawn as the missiles became obsolete. Then eventually in the late 1960s, the entire airfield was sold, buildings were demolished and the area was returned to agriculture once more. 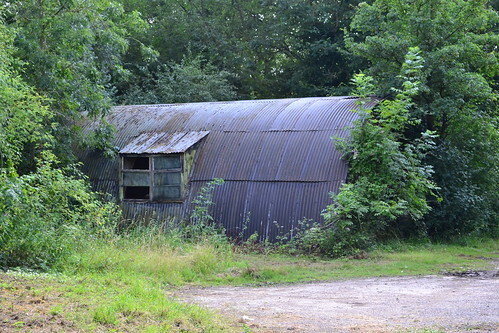 A decaying Bloodhound Maintenance Shed. However that was not the end nor the demise of Rattlesden. 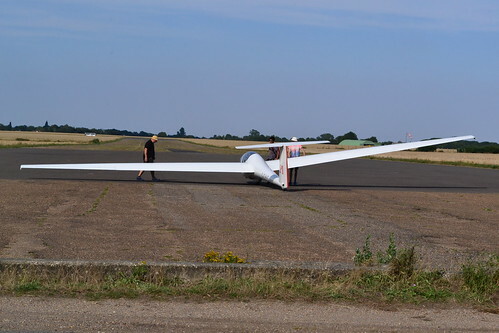 Whilst the majority of the site was demolished, a large section of the main runway still exists and offers flying opportunities in the form of the more sedate gliders of the Rattlesden Gliding Club. They have also managed to retain the former control tower which is used as a club house. 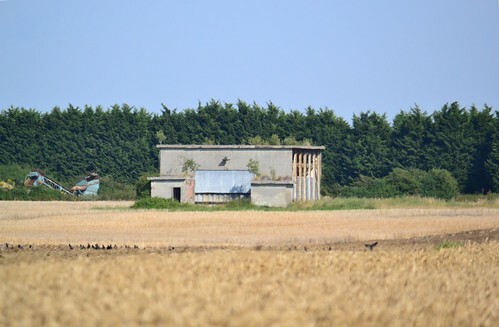 Further buildings also remain; a T2 hangar along with a number of smaller huts from the Technical site now house farm machinery and a maintenance shed for Bloodhound missiles now stands idly and alone in one of the fields. Around the outside, sections of the hardstands can also be found as can parts of the perimeter track now used by the local farmer to move machinery around his property. At the rather innocuous but once thriving entrance, the fire station hut still stands rusting and decaying amongst the trees. All is now in private hands and even access to the gliding club is limited. Rattlesden, quiet and secluded, holds many dark secrets, tales of bravery, heroism and stories of lives lost. 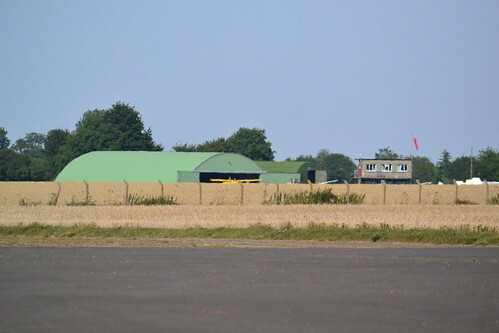 The main runway now supports gliders. After we leave the quiet and delights of Rattlesdon, we travel on to our next airfield. Tucked away amongst the fields of Suffolk and a short distance away is Lavenham. * Seven Spitfire FMk.IXs survive today that flew with this squadron in 1944-45. This is by far the largest number of surviving aircraft associated with a single squadron. *2 “Rattlesden-07-may-1946” by British Government – Royal Ordinance Survey. 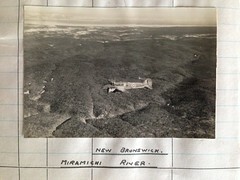 Annotations on photo from Freeman, Roger A., Airfields Of The Eighth, Then And Now, 1978. Transferred from en.wikipedia Original uploader was Bwmoll3 at en.wikipedia 10 October 2006 (original upload date). Licensed under Public domain via Wikimedia Commons. 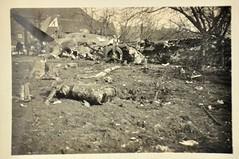 You might find the following links of interest with regard to the 34th Bombardment Group (H): http://valortovictory.tripod.com/, http://www.johnfunk.com/WWII/MendleshamMemories/, and http://www.8thafhs.org/bomber/34bg.htm. Thanks for those, I’ll take a look.